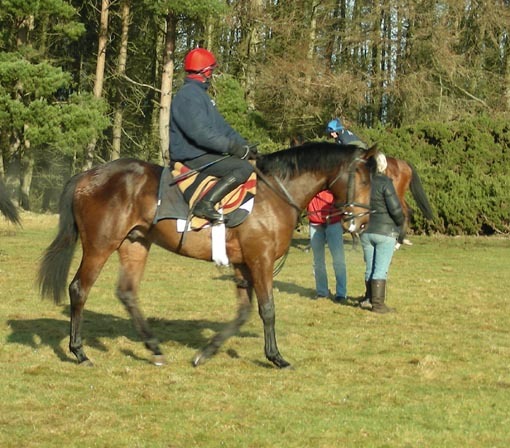 Bobbyscot, 2007 colt by Alhaarth ex Sogno Verde, seen here at excercise in February. Bobbyscot misses out narrowly on his second start at two! 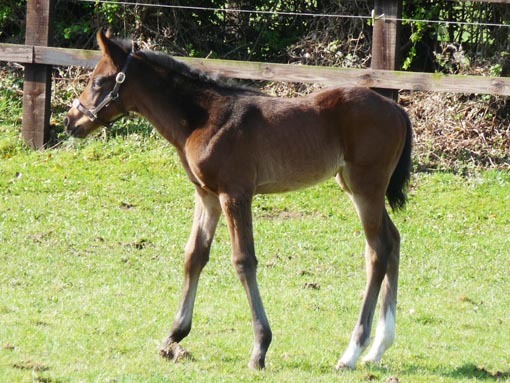 Latest Update: Bobbyscot, Sogno Verde\'s first foal by Alhaarth, ran second, beaten a short head on only his second start (2yo Maiden race) at Gowran Park last week. He was beaten by Lord High Admiral, a son of Galileo and a 500,000 euro yearling purchase, trained by Aidan O\'Brien. Great excitement for all at Swordlestown Little when the 2007 Dubawi colt out of Lady Bex made a record price of 280,000 euros at the Breeze up Sales in St. Cloud last week. The colt who was always on the small side but correct and strong showed how to translate a poor yearling sales price into a great profit for the shrewd and very professional breeze up consignors. He brought his Breeder Sean Mulryan a mere 26,000 Guineas at last year\'s Newmarket Yearling Sales, but he was bought by Bobby O\'Ryan (for Willie Brown of Mocklershill Stables) who obviously spotted some potential. 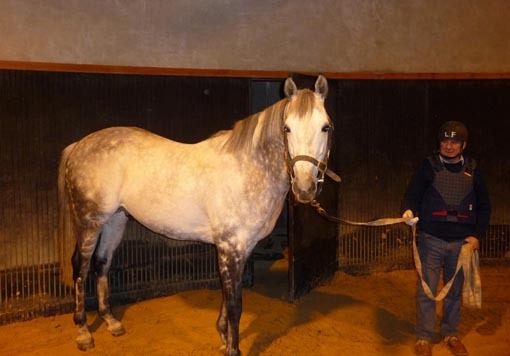 This was translated into 280,000 euros after the colts impressive breeze yesterday. Well done to all involved! This is what keeps the industry going and lets hope the colt will turn into a useful racehorse for trainer Jean Claude Rouget and owner M. Laboureau. 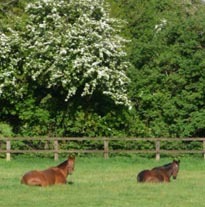 Our seasonal English visitors, Cover Look and Midnight Angel, have now returned home and we are pleased to report that they are both in foal to Dalakhani and hopefully will have lovely January foals in 2010. 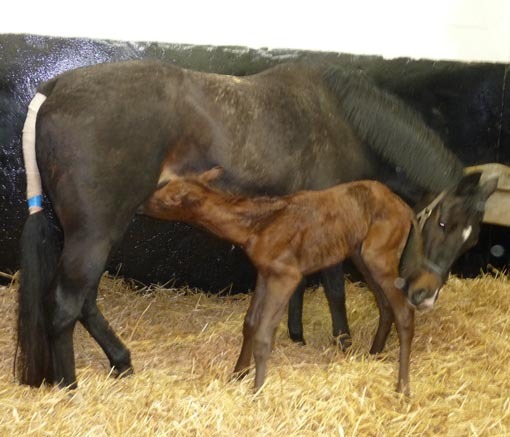 The other mare owned by Newsells Park Stud, Southey has foaled a nice colt by Refuse to Bend and was covered by Intikhab. Khatela was covered by Cape Cross and Pinaflore has gone home with her Dalakhani filly. This means that Des and I can take out saddle and riding boots and head to Mr Oxx\'s yard on the Curragh first thing in the morning! Just in time to enjoy seeing his Guineas favourites Arazan (whose dam is a half sister to the dam of Stariya) and Sea the Stars as well as the Derby fancy Mourayan along with old favourites like Katiyra. 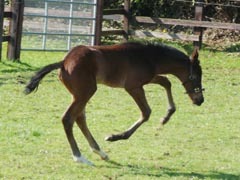 We are very happy with the progress of our foals. 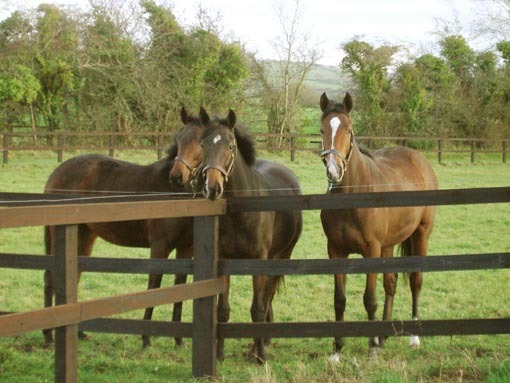 The Oratorio filly out of Stariya and the Marju filly out of Khatela are particularly nice. This full sister to Listed winner and Group placed Massive, should be an attractive commercial prospect, even in these difficult times. We are very happy to report that Rolf Schmid\'s Romandie, the famous Swiss racemare, has been scanned in foal to Peintre Celebre. 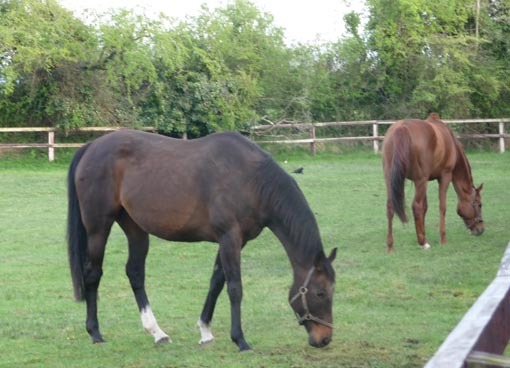 Also in foal are Miss Shaan (Oratorio), Miss Lloyds (Namid) and Sogno Verde (Dylan Thomas). To have her pregnancy scans next week is Third Dimension (Lawman). Stariya who has had three lovely fillies in a row was covered by Khelyef last week. PS. Mr Oxx has trained his first 2000 Guineas Winner with Sea the Stars last Saturday in Newmarket. This half brother to Galileo has just about the best prospective stallion pedigree around, being by Cape Cross out of the legendary Urban Sea. We now must hope very much that Khatela will go in foal to Cape Cross! 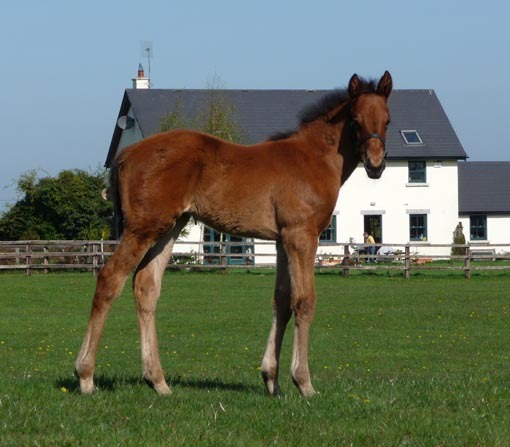 This would be her tenth foal in succession. 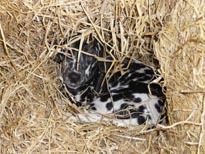 Romandie resting with a friend and Freckles who is delighted that the foaling is nearly over! 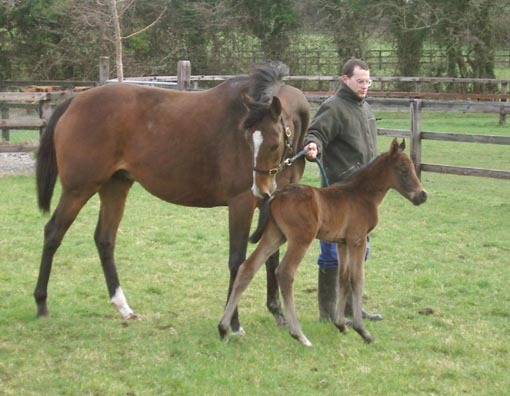 A lovely filly by Dalakhani out of Pinaflore was born on Wednesday afternoon.